The tail of the AirAsia plane that crashed two weeks ago has been recovered from the seabed, the Indonesian navy has announced. Divers used an inflatable device to pull the tail to the sea’s surface. They are also searching for the plane’s “black box” flight recorders, which officials believe have been separated from the tail section. AirAsia flight QZ8501 disappeared from radar in bad weather on December 28 with 162 people on board. It was flying from Surabaya in Indonesia to Singapore. Forty-eight bodies have been retrieved so far. Search teams believe most of the remains may still be inside the fuselage of the plane, which has yet to be found. On January 9, pings were detected in the Java Sea near where the tail was found. Officials said they could have come from the plane’s “black box” flight recorders. The rear part of the Airbus A320-200 was spotted on January 7 by an unmanned underwater vehicle at a depth of about 100ft. 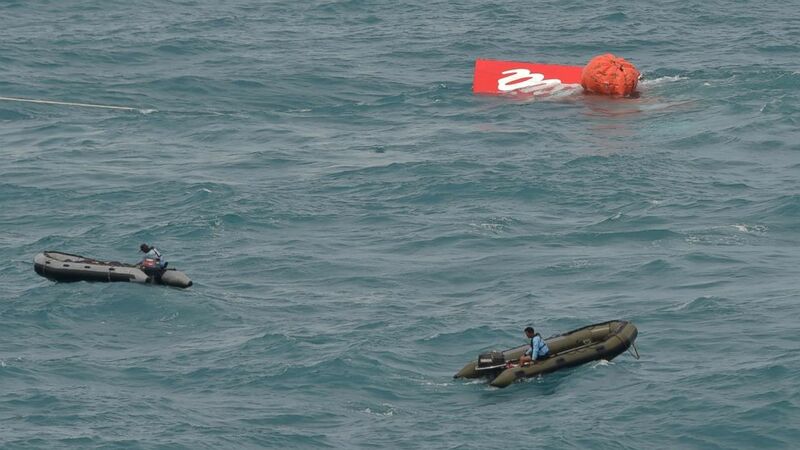 It was upside down and partially buried about 20 miles from the point of last contact with the plane, off the coast of Borneo, authorities said. Search teams have been pulling bodies and wreckage from the sea but progress has been slow due to high waves and stormy weather. Finding them has been one of the top priorities for search teams as they provide crucial clues from the last moments of the flight before it came down.